Murder mystery parties are a great way to make an average party into an exciting one. They usually center around the idea that each guest is a character with one guest who knows ahead of time that he or she is the killer. They instigate a lot of role-playing enjoyment and mysterious excitement. 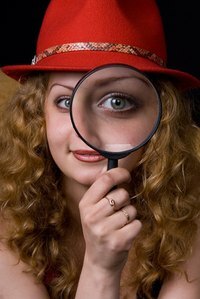 Creative ways to mix things up at a murder mystery party without spending any money ensure your guests leave the party having had the time of their lives. Centering your murder mystery party around the classic board game Clue draw guests into the game immediately. Not only do many people have fond memories of playing the game but also most are already familiar with the general rules and ideas. Designate certain rooms in your house as the “Study” or the “Billiard Room,” as they are labeled in the game. Assign each guest a role on a slip of paper, which they conceal from everyone else and then go throughout the house. One guest is the murderer, another is the victim, and the first to guess the murderer (and the weapon, and the room) where he “killed” the victim wins. It's best if you, as the host, take the role of "victim," so that your guests can all join in the game. One of England’s best loved storytellers, Agatha Christie also gives a murder mystery party an interesting twist. You can research her books online and give your guests the roles of certain characters to play throughout the evening. Serve typically British refreshments – like tea and scones – to finish off the theme and ensure you and your friends have a perfectly classy time figuring out who murdered whom. Designate one of the guests as Miss Marple, who will be in charge of uniting all of the clues that the guests have found at the end of the evening. She can reveal the secret to the mystery to everyone. Arguably the most famous detective ever, Sherlock Holmes is a great way to enliven a murder mystery party. Not only can you designate one guest as the murderer but you can make another guest Holmes and another Watson. Other guests can be victims or witnesses and Sherlock must solve the mystery before everyone has died. A British theme can help make this party even more authentic – once you’ve solved the mystery and sit down to port or sherry (if you are adults – fruit punch in fancy glasses if you’re not). Old-fashioned pipes make a great centerpiece for your table.